However, you cannot get the results you deserve with endless repetitions of tired old bodyweight exercises like pushups and situps, which is sadly the limit of what most trainers know about bodyweight workouts. Did you know that every year 36 million people take up jogging because they think it’ll help them lose weight and look better? In 2006, researchers from Berkeley and Stanford Universities revealed the results of their study on habitual runners. 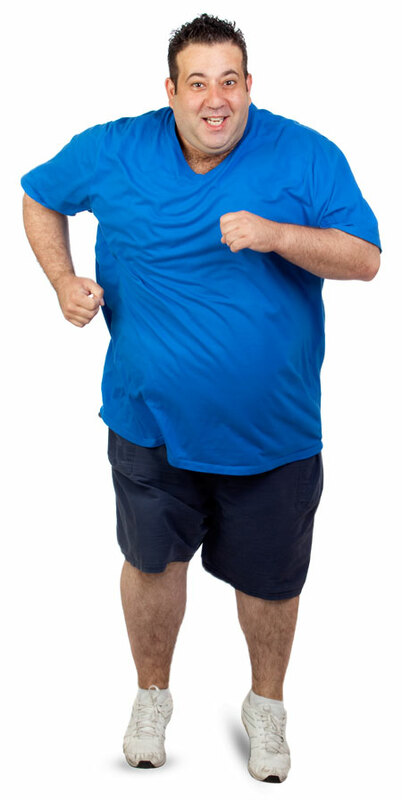 To the shock of the entire fitness industry, ALL the runners — including those who ran as much as 8 miles per DAY — got fatter with every passing year! Think about it: have you ever noticed that all those folks who spend hours every week on treadmills, stationary bikes and cardio classes never seem to change their bodies? But in high doses from long and stressful exercise, it actually forces your body into “protection mode” and makes you store more fat around your midsection. And it turns into the frustrating stubborn fat that’s almost impossible to lose as long as your cortisol stays high. Worse… it’s the type of fat that increases your risk of diabetes, heart disease and cancer. Proof: A recent study out of Australia reported that a group of women who followed a 20-minute program consisting of eight-second sprints followed by 12 seconds of rest lost an amazing six times more bodyfat than a group that followed a 40-minute traditional cardio program. And that’s just the latest in a long list of studies — stretching all the way back to a groundbreaking 1994 study from a Quebec City university — that prove you don’t need more than 21 minutes to experience the body you desire and deserve! However, fast does not always mean easy. In fact, I won't hide the fact that a few of your 21 minute workouts are going to be tough and intense. BW3 MultiBurn uses 3 scientifically optimal exercise methods that work together to give you a multiplier effect that keeps you in a fat burning state 24 / 7. And get this… as you'll see in a minute, unlike jogging and other long cardio workouts they actually create a cellular effect that allows you to eat more tasty carb-rich foods in order to accelerate your fat loss. I’ve tested and taught these same methods to my personal training clients and to clients around the world, both online and at seminars and workshops in Singapore, Australia, Slovenia, Germany, The Netherlands, Canada and the USA. Why do you see and read so much about crazy long or intense programs like P90X and Crossfit? Did you know one study showed that nearly 20% of Crossfit participants end up quitting because of injuries? Specifically, NINE of the 54 study participants had to QUIT because of "overuse injuries." I saw a P90X commercial this morning and was annoyed that they said the workouts could be done in "about an hour a day". If you actually do the "Ab Ripper X" on Monday, Wednesday, and Friday like you are supposed to it's an hour and a half. Yoga is an hour and a half too, which leaves only 2 out of the 6 days that are actually "about an hour"
Truth is, most people just can’t stick to that 90-minutes-a-day routine… and as you’ve already learned… you just don’t have to! Not to mention the fact that more and more studies are popping up, showing that long workouts also cause you to eat more, and store more fat. After all, exercise intensity is personal and subjective. What is a challenge for you today, may be easy for me after decades of training. Cardioflow is my fix for conventional "Cardio", and it’s an essential ingredient in rapid fat loss. Cardioflow puts you squarely in the "fat burning zone". That’s because you perform Cardioflow at precisely the level of intensity required by your body to use fat as its preferred source of fuel. So what makes Cardioflow so much better than something like jogging? With Cardioflow, you don’t get the excessive and chronic release of a hormone called cortisol that can actually make you fatter. Cortisol isn’t the only problem with running, biking or stair climbing though. Those forms of exercise also increase your chances of repetitive stress injury. And if you’re injured, you can’t exercise. If you can’t move, you get fatter. So what is it? It’s a sequence of bodyweight exercises that fit together in a fun movement chain. Clients tell me that doing Cardioflow feels like a choreographed dance or martial arts kata. You don’t just get the fat burning benefits — you actually have FUN with it too. Remember, it’s the secret-weapon that allows you to keep burning calories between more intense workouts while still recovering 100%. When you do a BW3 Afterburner session, you actually keep melting flab for up to 38 hours AFTER your workout. In the 24-38 hours AFTER a high intensity session like my Afterburners, your body works frantically to restore a “normal” state. It has to replenish the fuels you used, remove the garbage byproducts left in your muscle cells and repair any muscle damage from your exercise session. All of this takes calories. So you keep burning fat to fuel those repairs long after your workout is over. 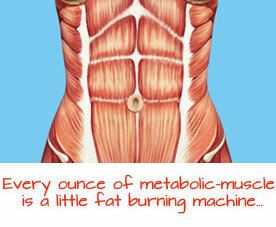 In a 2002 study, European researchers measured just how long the fat burning lasts from an Afterburner-style workout. By carefully measuring oxygen consumption in the hours before and after an intense workout, they were able to determine that the EPOC effect was still present 38 hours after a workout. That’s more than a day and a half of increased fat burning potential! This is where 90% of fat loss plans fail. Maintaining and even building the right level of lean calorie-burning muscle is essential if you want to hit 100% of your fat burning benefits. But most weight loss “gurus” ignore muscle entirely. You can think of a pound of muscle as a little fat burning machine. Even when you aren’t doing anything, it’s using up calories — as many as 50 per day. But the real magic happens when you start to move. The more muscle you have, the more machinery you can put to work, and the higher the "energy cost" you can create during a workout. 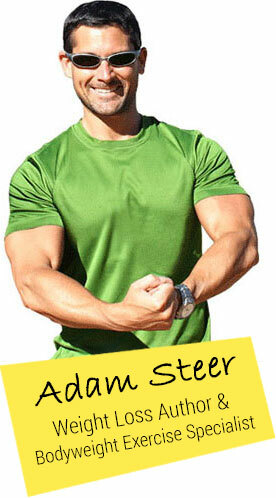 Doing an exercise with more muscle is like driving a big SUV instead of a Prius — you’re going to burn a lot more fuel. Another way muscle accelerates weight loss is through "insulin sensitivity." Insulin is your body's "storage" hormone — it shuttles energy and nutrients from your blood into your cells. If your insulin sensitivity goes down, you store more energy as fat. And BW3 Metabolic-Muscle Workouts are one of the most powerful things you can do to keep your insulin sensitivity high. And they wonder why you are losing weight so quickly, since they never see you “dieting," and you don't go to the gym! Isn't that incredible? All these benefits, just from avoiding long and tedious cardio? Yet I also went the extra mile to make sure the entire system is stupid simple for you to follow. You literally just turn the page and follow the step-by-step instructions. Heck, it’s easier than following the cooking instructions on the back of a Kraft Dinner box! The worst mistake you MUST avoid is exercising more than 30 minutes at a time. Longer sessions raise cortisol and force your body to store stubborn belly fat. The solution is found in a specific style of bodyweight workouts that actually improve something called insulin sensitivity and allows you to eat MORE tasty carbs to accelerate fat loss. The results have been proven time and again in scientific studies going all the way back to 1994 — and now you too can use the same done-for-you version of this workout system over 84,000 clients have been successfully using for over a decade. Listen, at one point I was more than 60 lbs overweight. Even when I became a personal trainer, there were times when I’d have to hide my body under baggy clothes because I’d let myself gain a bunch of embarrassing fat. Then just when I’d feel like I had things under control and I was looking fantastic, my body would break down again from over training and excessive dieting. At one point, I can remember not even being able to raise my right arm over my head or bend down into a squatting position because I was so messed up. And finally, I began travelling the world — emptying my Air Miles account — to take workshops, courses, seminars, and learn from folks who had ventured outside the mainstream fitness industry that I knew just wasn’t working. Which is why..
And they have to be done in just the right way to get you the exact results you desire. You feel you’re not even in good enough shape to start exercising. That’s probably the most common thing I hear from folks who are ignoring their health and their physique, and it couldn’t be further from the truth. In fact, I even provide a specific guide that tells you exactly how to modify the BW3 MultiBurn workouts no matter what shape you are in today — from total beginner to former elite athlete. You think you can eat however you want and rely on your workouts to lose weight. Look, the BW3 MultiBurn methods will let you eat more. However, you still need to follow a few very simple and unobtrusive nutrition “rules” if you want the body you desire. And I cover them in a valuable FREE bonus included with the program. You think short workouts means no actual “work.” Listen, nothing worthwhile is effortless… I’ve just made Bodyweight Burn as easy and short as it can possibly be while guaranteeing your fastest weight loss results. Or, you’re just one of those people who buys workout programs and lets them sit on your desktop. Please, don't waste your money if that's you. And if that IS you, just realize you're only going to continue gaining weight, losing flexibility, and getting in worse shape… unless you do something about it, starting today. By now you know that vanilla flavored bodyweight exercises like conventional push ups and sit ups are not going to get you the body you deserve. So Why’s It Just ? 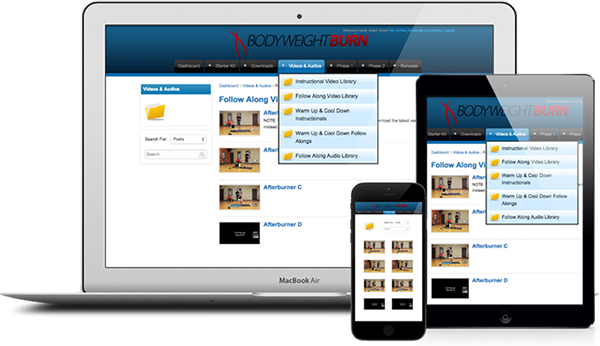 I am relaunching the Bodyweight Burn System this week — adding high-definition follow along videos for every single workout. Since I don’t have to pay for the DVD production or the shipping & handling, for the next few days I can pass on those savings to you! Although I don't have to pay production, shipping and handling on your immediate download, my server company has let me know when I hit a couple thousand copies I'll be forced to upgrade my service. And at that point I'll have to INCREASE THE PRICE. See the ticker in the table below to see how many copies are left at your reserved price... and order now to make sure you lock it in before it goes up. This is like having me right there with you… coaching you through your session. All 12 workouts in the system are delivered in high quality, motivating and easy to follow high-definition videos. All you have to do is plug in and play. This video library is worth the price of the entire BWB system by itself. 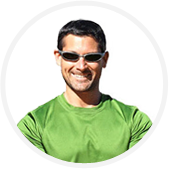 You have access to detailed video demonstrations of every exercise in the system, so you can get the greatest fat burning activation from every workout you do. BW3 stands for my three unique bodyweight workout methods. 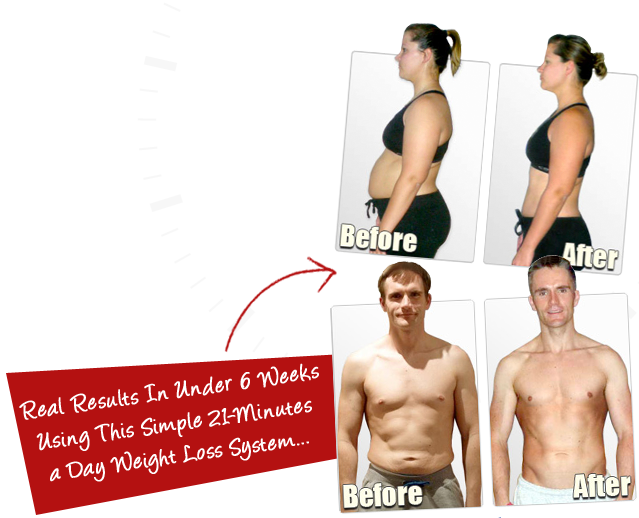 This manual contains every secret you need to melt fat as quickly as possible. All you have to do is turn the page and follow along—we take care of the rest! The Exercise Manual contains a complete library of written cues and still photos for every exercise in your Bodyweight Burn program. Hang these “done-for-you” charts next to your workout area to help keep you on track. And never waste time looking up exercises once you’ve learned the moves. Use this handy list to make sure you have everything you need before you start Bodyweight Burn. You won’t have to stop halfway through because you forgot an important detail. With the BWB Quick Start Guide you’ll be prepared for every step of your journey in advance. Do you love the program you’re already using? But you’d like to accelerate your results? Well guess what… al those guys amd gals with the best bodies at the gym… chances are they’re using secret-weapon techniques like BW3 workout to give them the extra edge when no one is looking. The Integration Guide shows you exactly how to use the BW3 Workout System with ANY other program you’re already using. We’ll also show you how to implement the Carb-Synch Diet system in any situation to drive your fat loss through the roof. Do you want to download all your videos and guides to your computer? Or would you rather stay mobile and use the complete Bodyweight Burn system from anywhere, anytime? The choice is yours! 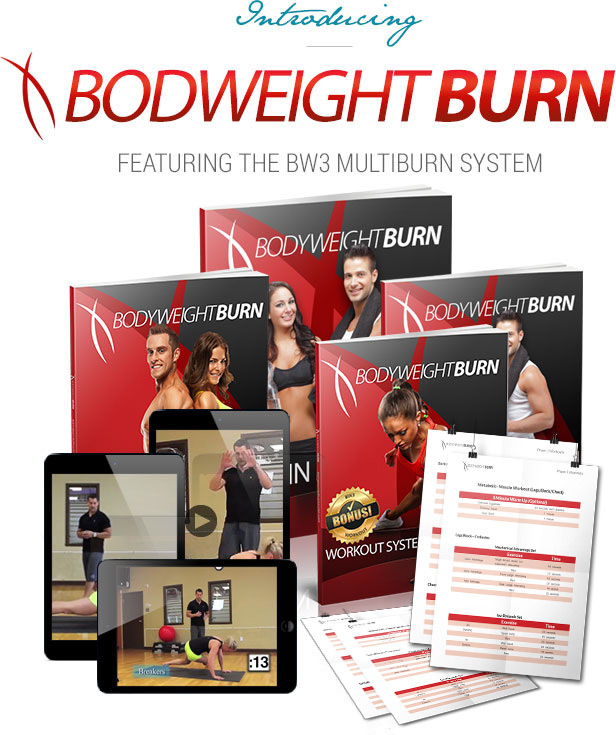 Everything is available in our fully mobile and carefully designed Bodyweight Burn System portal. You can access everything to stream, or use the handy links to download anything you want. First … I must point out that this special one-time bonus to register for FREE is only available until all available spots fill up. Because this exclusive community simply isn’t designed to handle many more members. Now let me tell you a little more of what you’ll experience with your free bonus trial of the BW3 Platinum Club. You see myself, and virtually all of our members you’ll meet, consider BW3 Platinum Club the most important and fulfilling part of your transformation BY FAR. 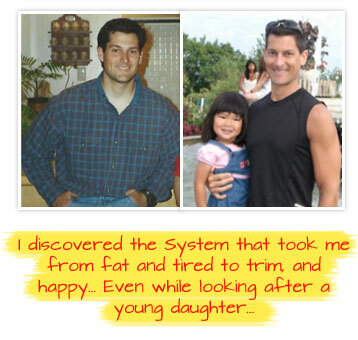 Inside you’ll also continually receive unbelievable value-added bonuses … for FREE … to accelerate your body transformation while making it a whole lot easier and more enjoyable. You’re finally going to get your head clear about everything in the diet and fitness industry. With the BW3 Platinum Club you won’t guess… you’ll know. If you’ve made it this far, I know you have it in you to reach your goal. And I want to make sure you get there as quickly and easily as possible. However, like it or not that requires change. You COULD keep doing what you’ve been doing until now. Yet it will just get you right back to how you look and feel today. Or worse… if you manage to dodge the onset of diseases caused by excess cortisol or insulin resistance, you will still end up frustrated and embarrassed by your body. You’ll still struggle with roller coaster results… looking great after weeks of deprivation dieting and punishing workouts only to “fall off the wagon” again and slip right back into your fat clothes. And if you have kids, your time with them will be limited by the aches, pains and accelerated aging of long workouts or shoddy exercise technique. And 2 months from now, you’ll look back with regret while folks using the BW3 MultiBurn system will be feeling the high of youthful energy and a firm, athletic body. P.S. 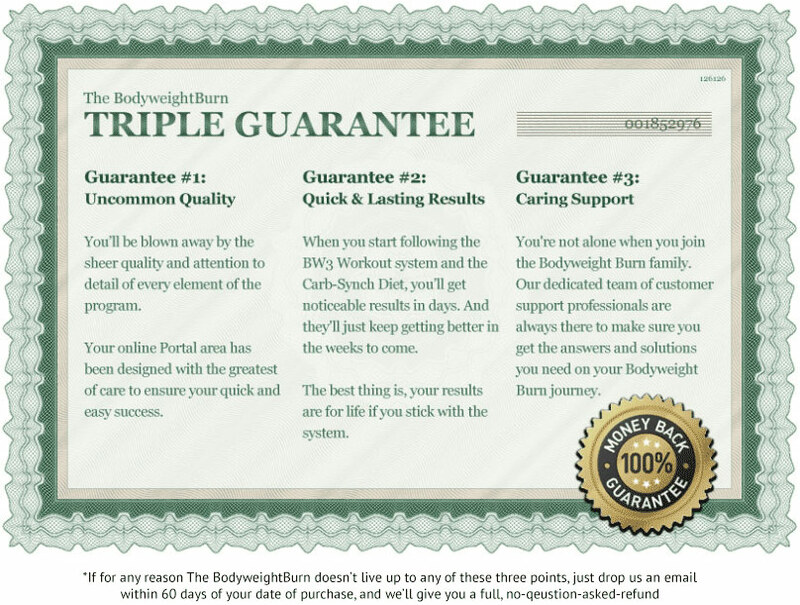 You don’t have to decide today because you’ve got my 100% money-back guarantee for the next 60 days. You can go through the entire Bodyweight Burn program before you even decide if it’s for you. And if not, I’ll refund every penny, no hassles and we part as friends. P.P.S. Remember, University research has proven that popular “weight loss” workouts are actually making you fatter. And tons of studies going all the way back to 1994 prove that the right kinds of workouts actually give you 100% weight loss benefits in only 21 minutes. And that these workouts will reduce your risk of disease, build up your energy, increase your flexibility, and of course shape and tone the body you desire. However, only the “multiplier effect” gained using the 3 specific workout methods on this page will give you the weight loss and health boosting results you want. And all this is achieved using your own bodyweight with ZERO weight training or cardio equipment. Copyright 2015-2019 bodyweightburn.com · All rights reserved.